Originally from South East London, Gary Seager pulled Bad Pennies together when he turned up in the Medway Towns (they’re in Kent, in case you’re wondering). After more than a few changes in personnel, the current band has been working together for a couple of years. 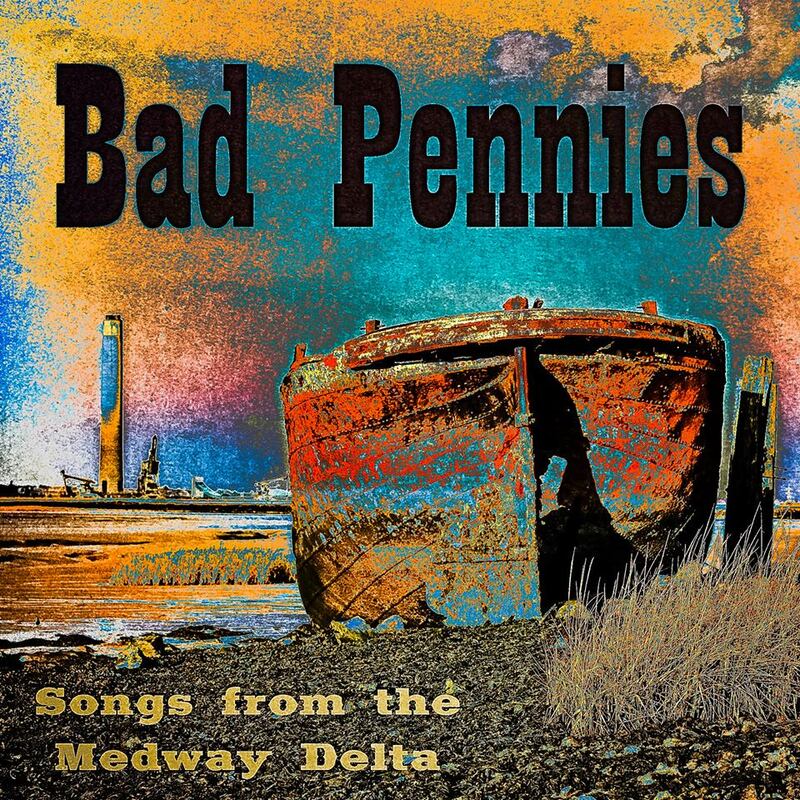 The band released their first EP in 2016 called, Turn It Up Again but now bring us their first full-length recording, the aptly named Songs From The Medway Delta. Featuring all original compositions, the album was recorded and mixed in just 3 days, with the aim of capturing the live essence of the band. The list of influences on the band is impressive: Blackmore, Gallagher and SRV for guitarist Seager; Nicky Moore for singer and harp player Adam Stocker; Palmer, Paice and Rich for drummer Dave Two-Jackets whilst bassist Gavin Matthews comes from the world of NWOBHM. A fine tapestry of talent to inform their writing and in turn to weave their own magic? Well, the new album is a skilful take on a familiar rock-blues template with shuffles, funk, boogie and proper rhythm & blues, with plenty of variety to engage the listener. The opening Crash & Burn, gives us a straightforward SRV style Texas shuffle but with a nice bit of slide in the guitar solo. Lady Luck is underpinned by a funky riff reminiscent of Tommy Bolin on Getting’ Tighter, before we get a tasty wah-wah, bookending a well thought out solo. Back to an SRV styled intro for One Shot (Ballad of a No-good), which isn’t a ballad by the normal definition. Another slide solo gives it a dynamic that belies the title. Walk Away is a slower paced blues with more than a hint of funk and surprising tempo changes and again has a thoughtful solo across a tempo change. Medicine Man has brushed snare over an essentially spoken word number before a country-flavoured harp adds colour as the story of medical advice to lay off the booze is told. Mynah Bird is pure Texas shuffle again as the story of this bird unfolds, I am fairly sure it is allegorical! A lovely and varied guitar solo pulls this song out of the ‘heard it all before’ category. When I Get Drunk aims for a New Orleans feel, and uses a stop-time attack and, unfortunately, falls into the trap they avoided on the previous track. AM Blues is a solid blues song and the AM of the title refers to the ever-popular blues chord, A Minor, as well as to the time of day. Once again, a well-placed guitar solo drags a standard into being a little bit special. Please Baby is weakened by the smothered sound of the guitar and, despite the slide solo, it doesn’t stand out enough. Hometown Blues has a great guitar solo and the bass line is genius and some of the background riffing brings Trower to mind. Queen of all the City is an out and out rocker, which could be from Canvey Island rather than the Medway. Midnight Train also has a slight (quality) punk feel and, like the last track, the inimitable Wilko springs to mind. Temperance Boogie does just what is suggested: a boogie at a cracking pace with yet another inspired bass performance as it tracks the guitar. Nostalgic vinyl crackles and hiss introduces Losing Streak. A resonator led country blues song, which after the frenetic pace of the last track is a great way to close the album. I love the sound of the steel bodied guitar family and the way Seager combines picking and slide is just my cup of wine. All in all, this is a thoroughly enjoyable album. OK, sometimes there are too many SRV references when you are hoping for their own identity to shine through. There is nothing ground-breaking here either, but what you do have are 14 tracks of good quality blues played well. I would expect that their next album will benefit from this first experience of writing and recording their own songs, and will be more varied and cohesive. Well worth a listen.